Mother pigs raised in sanctuary remain with their children for their lifetime and continue the same maternal care even when their adult offspring have grown up. 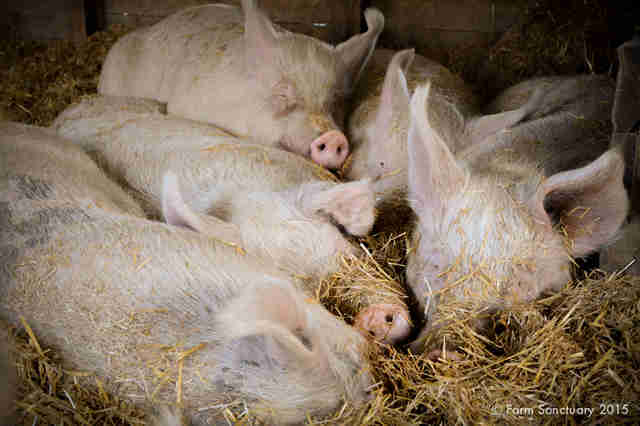 They make large nest-like beds for sleeping, protecting them from other pigs and from situations they deem dangerous, and continue to have the respect and love from their babies even as they age. Examples from our shelters: Nikki still to this day makes straw nests for her offspring. Her babies - some the same size as her and her son about 200 pounds larger than her - nestle as close as they can to their mother. On occasions when Nikki has had to leave for medical treatments, she can look forward to a welcome-home celebration from her daughters, who run around her and playfully bump her while barking to express joy. A sanctuary setting affords cows a unique opportunity to form deep bonds with their children. 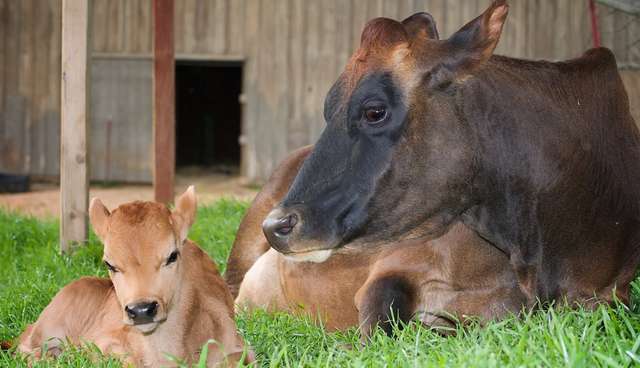 They are allowed to nurse their calves for as long as they wish - even when they are larger than their mother! We witness this beautiful psychological bond between mother and child daily within the herd of families who arrived together. Babies, even as adults, stay close to mom for protection, but as they grow and age, this bond deepens in the form of companionship. Mother cows groom their calves for hours and as they reach adulthood spend hours grooming each other. They too form lifelong bonds even within a larger herd structure. 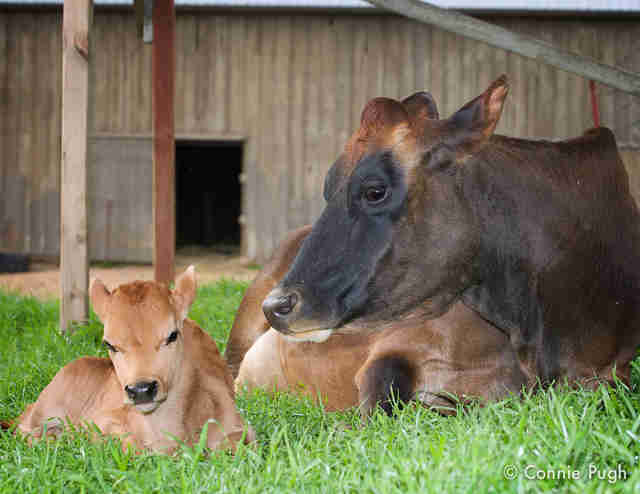 Examples from our shelters: Honey and Betsy were both very sweet and docile when they first arrived, but with the birth of Betsy's son Nutmeg, both girls became a little sassy, running caregivers out of the pasture in the evening when they would call the cattle in for the night. And I'll never forget our 2004 rescue of a herd of 26 starving, pregnant cows. The friendliest mother actually turned on me shortly after her calf was born and we attempted to snap a photo. I was left with a black eye and crushed equipment! 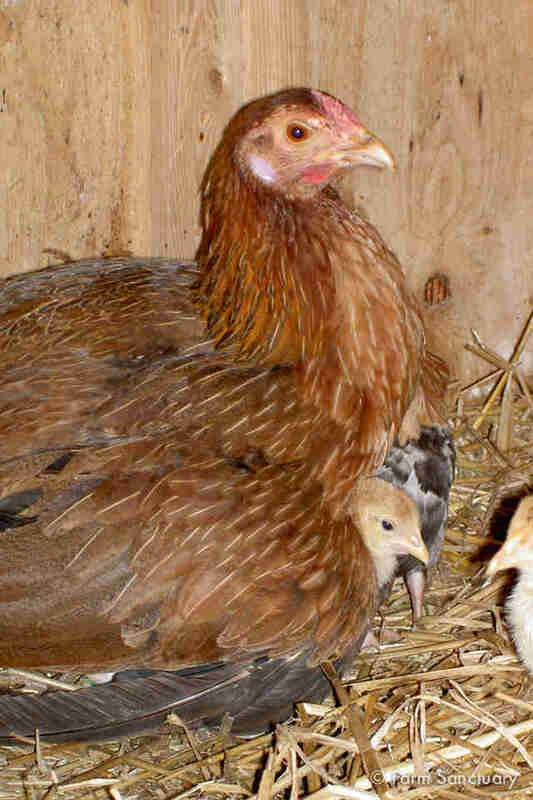 Mother chickens have such incredible maternal instincts that they will even look out for or even take on the children of other mothers when duty calls. We have seen this in cases where multiple mothers come in with chicks of varying ages and sizes that are clearly not all from the same clutch. They often take them on and nurture them like they would their own children. Here, we have witnessed mother hens vocalize to their babies as soon as they spot an aerial predator. They've even sounded the alarm on pigeons flying too low over the farm. 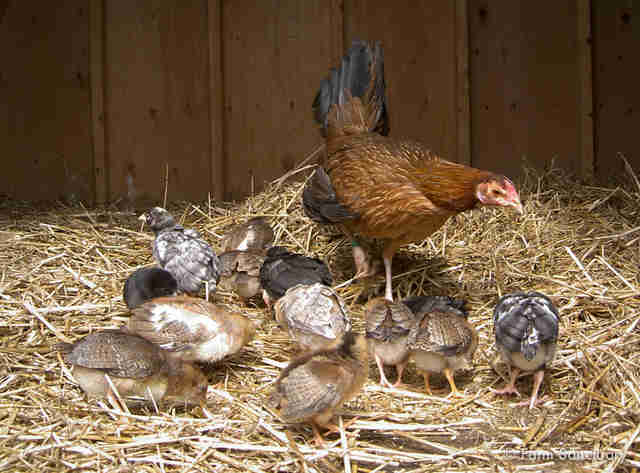 In response, babies run directly to mother hen for cover. And we witnessed our own example of hens hiding chicks when we took in a cockfighting ring that included breeding mothers and chicks. We had to pick up the mothers to ensure their chicks were accounted for (and get pecked at by their moms). One mother would not let us near her when the babies were under her and was so upset we used food to coax her to at least stand so we could count if there were more than two feet beneath her. Sheep mothers have a specific language they only use with their children, a deep guttural call that tells them to come back quickly or to beware of intruders. The call they make is very distinct and their lamb in a sea of lambs can recognize the voice of his or her mother. Curious lambs cause moms to go into a panic and they are often seen running through the pastures literally screaming for their babies until they find them. The lambs too have distinct calls and whenever they talk mom quickly responds. 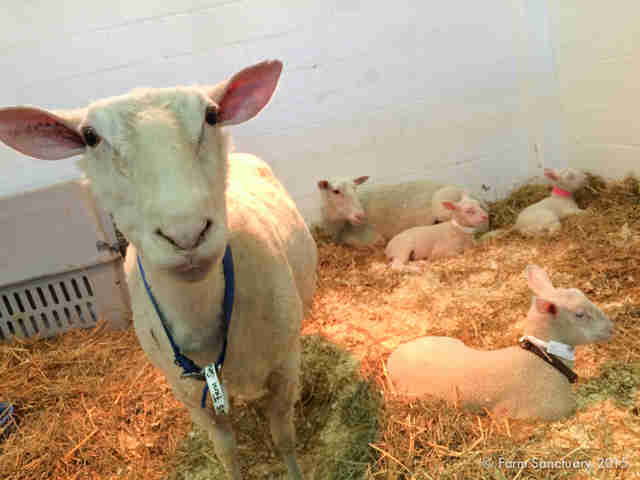 Sheep are flock animals are very family-oriented and stay with their families - moms, dads and siblings for life when allowed to in a sanctuary setting. Examples from our shelters: When Louise was giving birth, her mother Tracey - who gave birth ten days prior to Hazelton - was separated from her so that she could have privacy with her new lamb. Still, Louise talked to Tracey the entire time she was in labor and Tracey called back to her. We put them together within a few days since they seemed too stressed. Louise was also producing limited milk but had twins, and Tracey allowed them to nurse from her. Goats are super moms and have amazing lifelong relationships with their kids in the sanctuary setting. We have groups of goats who still sleep side by side - even wrapping their necks around each other - with their now full-grown kids. Left to their own devices they will stay with them for life. Goats also recognize their offspring and family even after periods of separation. 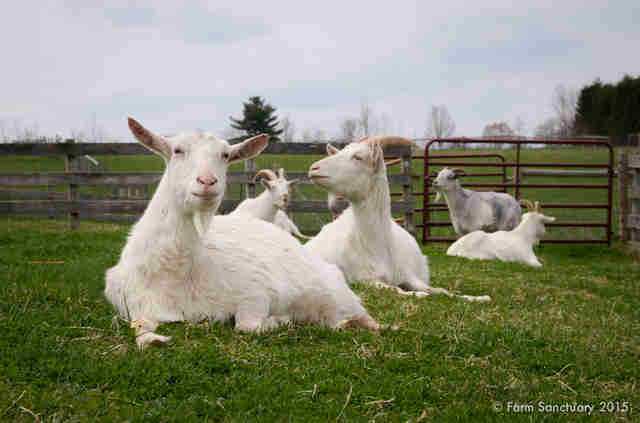 Examples from our shelters: We have taken in rescued goats that were split up from goats who went to other sanctuaries and homes - and in a few cases they have come back to us and immediately reconnected with their original family members, even within a larger herd. We also had a goat named Juno whose baby crawled under a fence and ended up in a pig area and then panicked when he could not get back with mom. The fence was too tall for her to go over and she could not fit under so she threw herself over and over into the fence trying to get to him. We heard her panicked screams and came down to put them together, and her son Sebastian immediately started nursing. She would have done anything to get to him. We also have a goat named Lizzie, who is elderly and has horrible arthritis. She requires regular treatments and her sons go along with her. The three still sleep together. her sons much larger than her now, but forever loyal to mom. Examples from our shelters: We count our birds each night, and so you can imagine our concern when we realized we had a female duck who disappeared. We looked everywhere and could not find her. We feared she'd gotten out or, worse, was killed by a fox or other predator. Then one day - a month after our failed search - she popped out of a muskrat hole in the pond and behind her were six tiny ducklings. It took us hours to catch her; we waited for her to exit the pond and bring the family into the barn. She hissed and ran at other ducks and geese in the flock. 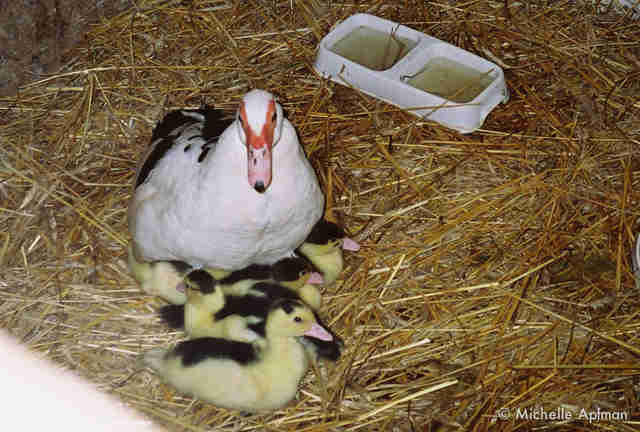 When we finally got her to settle down, we were able to whisk her and her ducklings off to our health-care area where they could be safe from harm. 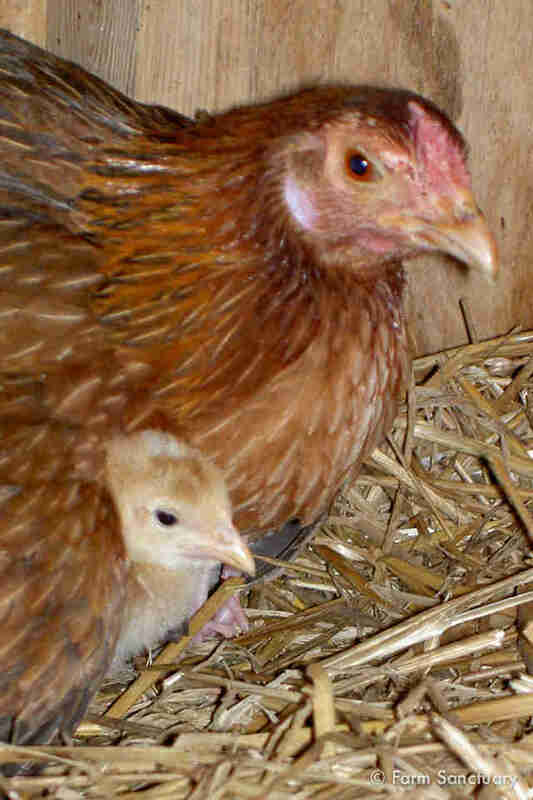 And of course, mom kept the little ones hidden beneath her wings.